1. A set of tests conducted on the Shroud place the cloth to the time ranging from 300 B.C. to 400 A.D., well within the time of Jesus of Nazareth (Stanglin, USA Today, 2013). 2. The bloodstains, as forensic scientists and chemists now know, were created by real blood, specifically blood of a torture victim. In addition to that, an x-ray-taken showed excess iron in blood areas, as expected for blood. Microchemical tests for proteins were positive in blood areas but not in any other parts of the Shroud. Furthermore, claims are that the blood has been confirmed as authentic hemoglobin and identified as Type AB! 3. 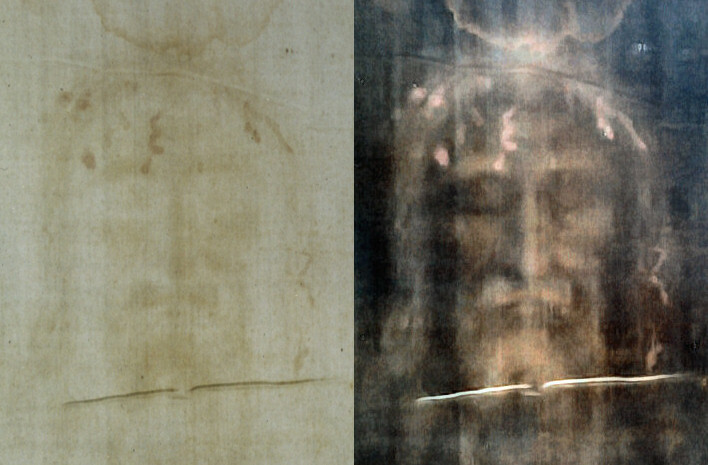 Microscopic traces of the flowers, and pollen, has been found throughout the Turin Shroud. Out of hundreds of flowers on the Shroud, twenty-eight of them grow in Israel. Twenty grow in Jerusalem itself, and the other eight grow potentially within the close vicinity of Jerusalem (Whanger and Whanger, Duke.edu, 2015). Of these twenty-eight plants, twenty-seven of the identified plants are in bloom in March and April. Jesus was crucified in Jerusalem during the Passover in the Spring of c. 30 AD. (Matthew 26:12; Mark 14:1; Luke 22:1,7: John 18:28) Half of the floral images and pollen grains from the plants are found only in the Middle East or other similar areas but never in Europe, the favored location of the forgery of the Shroud. Most of the flowers were clustered around the head and chest of the man on the Shroud - consistent with Jewish burial custom in Jesus' time. 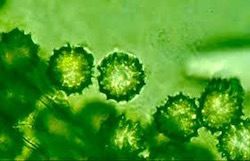 The pollen also dates to the first-century, further indication that the Shroud was first found in first-century Israel. In addition, many grains of the pollen, Gundelia tournefortii, have been identified. This particular pollen has large thorns, blooms in Israel between March and May, and most of the grains of this pollen have been recovered near the man’s shoulder! Could it have been the crown of thorns (Matthew 27:29)? 4. The image is not a stain, it is not painted on the Shroud, nor is it burned on. Instead, it is seared on to the cloth with a technology that has yet to be explained. Scientists can’t even reproduce it with modern technology, let alone medieval technology! Nothing existed in medieval or ancient times that could produce such an X-ray as this. The only explanation would be some sort of large burst of radiation, that was emitted as Jesus was resurrected from the dead, creating the image on the cloth. The process causing the yellowness of the top most fibers of the threads responsible for the image is also unknown. 5. 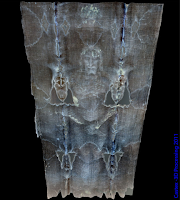 The image of the man on the Shroud can be read by 3D imaging technology, something that paintings can't do. The image on the Shroud is also only a few fibers deep. The image on the Shroud is not a painting, and that's a fact! 6. The type of cloth is consistent with fabrics from first-century Israel, but not with medieval Europe. A forger would have had to not only forge the image, but would have had to have detailed knowledge of linen weaves of the first century and then not only reproduce it, but age it convincingly. 7. Usually, whenever there's a picture depicting the crucifixion of Jesus, it shows the nail prints in the palms of the hand. However, modern science has shown that a nail through the middle of the palm of a man's hand would not be sufficient to hold most of the weight of a man on a cross. The nail would tear through the hand. The placement of the nails in crucifixion was most likely in the wrist. The Turin Shroud shows the nail marks at the lower part of the hand into the wrist, just as expected! Also, experiments conducted on cadavers note that the Turin Shroud accurately depicts how crucifixions would have transpired. In addition, the whip markings on the man’s back match the ends of the flagrums used by the first-century Romans for scourgings, his body shows signs of rigor mortis in a crucified position, some of his blood flows are post mortem, and it even shows marks indicating a spear wound - consistent with John 19:34. It matches the details of Jesus’ crucifixion accurately! 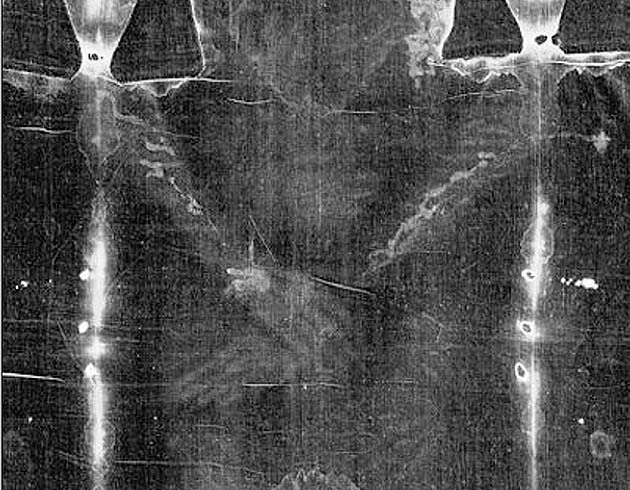 The evidence seems highly probable that the Turin Shroud is genuinely the cloth that covered Jesus of Nazareth before His amazing resurrection from the dead. However, we do not need to rely solely on the Shroud of Turin to provide evidence for the resurrection of Jesus, since the evidence from both Christian and non-Christian sources alone are enough to verify the reliability of the crucifixion and resurrection account. See: Historical Evidence For Jesus' Resurrection. Not once did I claim that the Shroud was the only burial cloth of Jesus. There is also the face/head cloth.It is the Sudarium of Oviedo.It matches the Shroud perfectly around the head area. It even has the same blood type. Before you go screaming its a fake or that there is more than one cloth..etc.. do some research. I have several books, DVDs, have several dvds from the History channel where people have done 3D images and the scientist who was doing the experiments was an atheist who didn't believe. But after doing the experiments he did believe it was real.This article is only the tip of the iceberg to the actual findings on the Shroud of Turin. After all my HOURS and WEEKS of research, not just my assumption, I have come to the conclusion that it IS the burial cloth of CHRIST! and that the Sudarium of Oviedo is the head cloth of Christ that was folded. Do you know the significance of the head cloth being folded???? It says it was in the Bible. In ancient Judaism, when a Jewish person was through at a mea, he just threw the napkin on the table in a crumple. If he left to go somewhere it let the person cleaning up that he was done. However, if he was not done, he FOLDED his napkin and set it aside. That let the person know "THAT HE WAS COMING BACK"! There are a lot of things in Judaism that bring the Bible to life like you've never read it before. Study the Feasts of the Lord.Study the Jewish wedding ceremony.Perry Stone and Mark Biltz are great at explaining these. But definitely study the shroud. Some other things are dirt on the shroud from only around Jerusalem, marks on his back from carrying a heavy object like a cross or cross beam, shoulder out of joint and the Bible says his shoulder was pulled out,also this man on the shroud had no broken bones which is not typical because they would break the legs of the victims after so long so they would die quicker. Jesus had to broken bones. There are paintings and pictures and written documentation of a cloth being displayed throughout the years dating back to the 1st century.Not before and there is no record of any other shrouds or face cloths popping up in the world.There isn't any others because there was only one resurrection..Jesus. I live in Colorado. One of the men,John Jackson, who actually worked on the Shroud back in 1978 lives here in Colorado and he has a Shroud of Turin Research building in Colorado Springs. He has a full Life size replica of the Shroud up along with all kinds of models from all the findings from 1978 and throughout the years. I was blessed to go there for a talk and tour a couple of years ago and it totally confirmed my belief that the shroud is the burial cloth of Christ. He also believes it. I plan on going there again this year because it my awe and amazement I know I missed something. Now it may not be ... but they can't figure out how it was made other than an extremely bright light for a split second...like the "twinkling of an eye" maybe? The head cloth that matches perfectly with the blood stains and bilirubin from the shroud head , plus the same blood type which is very rare and is from the Middle EAst! Bible says study to show yourself approved. We know the head cloth existed and we know the burial cloth did. And we know it would be a miraculous event when Jesus came back. So why would you think this a fake? Research it. I don't think it is. I think the disciples saw the images on the cloths and kept them. Maybe Mary and John kept them, they were Jesus' burial cloths after all. And through the years churches got them and kept them. The can trace it back to Jerusalem and the 1st century! I think the Lord wanted to preserve it for all the Doubting Thomas' out there. Jesus didn't reprimand Thomas when he said he needed proof. He said here Thomas put your finger and my hands and in my side...then Thomas said my Lord and my God!!!! Maybe people who are doubting Thomas', who are on the fence or who don't believe can research this and the head cloth and then come to say my Lord and my God!!!! Good article and a very good answer to Home Site! Only an unbeliever would argue the Shroud is fake! I have heard it said that if this was the burial cloth of anyone BUT Jesus Christ, the forensic evidence would be considered irrefutable. People don't believe because they don't want to believe in Jesus Christ. Why, I'm not quite sure.